RUDE GOTH began with a set of “Old English” stencils. I used a natural sponge to print them and get an authentic texture. Goth, but also for perfect for a Halloween, pirate, or rough historic feel. Includes upper and lowercase, numbers, punctuation, and international characters. DYNAMOTOR is my hand-drawn take-off of the classic font Dynamo. Dynamotor has the texture of diagonal crayon strokes which complements the bold, active letterforms. Looks great reversed for a chalk or scratchboard look. Dynamo was designed by K. Sommer and first released in 1930. Its distinctive “fins” give it a touch of machine-age deco. Dynamo is available from many sources online; Dynamotor is NOT a Dynamo font. 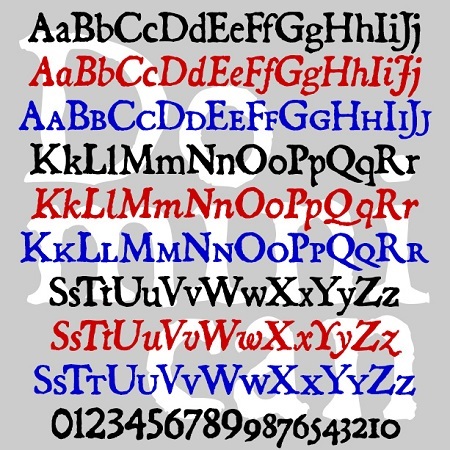 Includes uppercase, numbers, punctuation, and international characters. Dynamotor was inspired by this book cover, designer unknown, found on the delightful blog Awful Library Books.